Some of you may have heard about the newly proposed labor laws set forth by the Department of Labor regarding youth working in agriculture and how just late Thursday night they have pulled away from these overreaching regulations!! These laws, if put in place, would have been a huge detriment to our industry. I believe as a family farmer that safety is hugely important and something that needs to be addressed every day, especially when you have youth working on your operation. But I also believe that these rules were very over the top and would have prohibited many of us from even employing our own children to drive a combine! 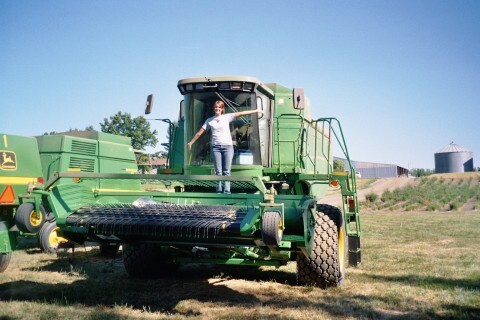 My Cousin Emily who also worked on our farm for many summers! The DOL asked for comments this past year and here are a few of the concerns that I had, among many, with their new regulations. 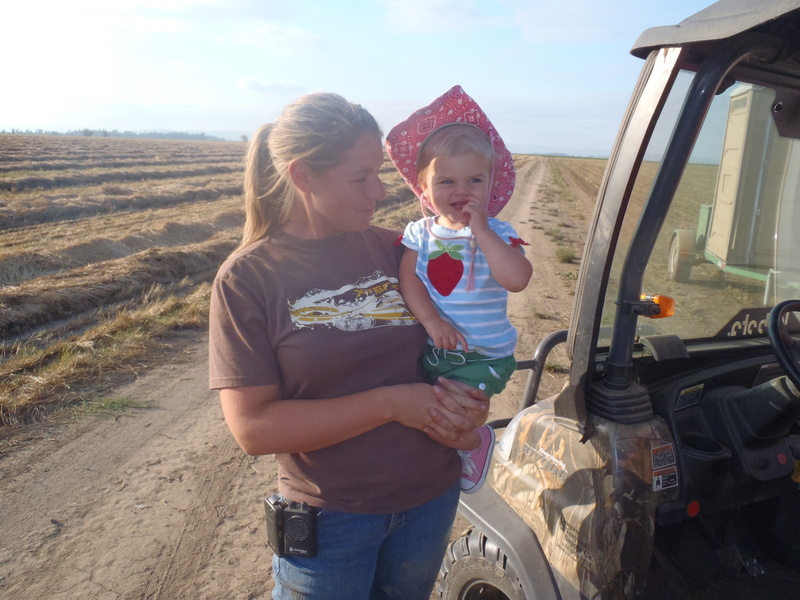 I am a third generation farmer in Oregon and have been farming with my mother and father now for five years. Although we are an incorporated farm, we are still a family farm. In these proposed rules we would not only loose our “family farm” exemption just because we are incorporated, we would also lose the ability to hire youth from our very own families who we have relied on for generations to help during the busy times of year. I grew up farming as a youngster on the farm and have taken away problem solving skills, a good work ethic, and a chance to have real responsibilities. All of which have helped me and my siblings and cousins be successful into adulthood. I think that to take away this opportunity for young people who are family members is a mistake! I don’t yet have children of my own, but I plan to incorporate not only my own children, but also my nieces and nephews and someday grandchildren into this farm. Please do not take away this opportunity for them to have a place here. I hope that future generations of children, nieces, nephews and grandkids can learn what I’ve learned and come away with a true respect for farming and all that it does for this country. The start of the next generation for our Farm! Another concern is the 90 hours of schooling that will be required of the youth in order to come and work on the farm. I think that this is way too much a burden and will cause our ability to get youth to come and help with the harvest impossible. At a time when agriculture isn’t being taught in every school, and being cut from programs across the nation; we have to think of the realistic problems this will bring. Plus majority of the information needed when working on a farm is found right there, with the best teachers, the farmer’s themselves. We already have rigid safety rules that are required for all employees no matter what their age; and I feel that these keep us safe everyday on the farm. I see more hourly classroom requirements only as a way to decrease the amount of youth that will be able to come back and help farm and get all the benefits that working there can provide. The maximum height restriction is another inappropriate limitation. Many of our harvest equipment is much taller than the six feet that this restriction allows, but they are as safe as if they were standing on the ground. Any other areas that are above that height such as lofts are always on our minds as possible safety danger areas. Because of that they are always a topic in safety meetings and in training; we are aware of the danger and have put in place safety measures to keep us all safe. Having been an employed youth on this operation and I can attest to how safe we are able to go about business, even over 6 ft from the ground. Ladders are another example of a place where we do business over 6 feet in the air. And again this safety issue is covered over and over again; we tell them how to do things right and in a safe manner. I believe that because we do follow regulations that are put in place already we have never had an injury from any event that started when a child was over 6 ft from the ground. I think that this shows how important it is to pay attention and be involved in your industry! Someone once told me that if you’re not at the table, then you’re on the table! Ever since then I have begun to realize how important agvocacy truly is!! ← The Hunt is On! I am all for allowing farms to also have kids work the fields at harvest time! Picking Beans, Rasberries and Strawberries was a wonderful way to earn money for school clothes and supplies. Having a little left over to buy a bicycle or whatever was really the only money many of us had in the early 50’s! The farms would come by to various street corners in east Portland in old school buses about 5 am, then pick up whoever was waiting with their lunch sack and take us away to the farms in Gresham for the day. We came home covered with dirt and fruit juice. Strawberry fights still are a wonderful memory ! Now what do the kids have do to make money and develop a good work ethic!